On Friday 13th September, Stefan will be playing bass and even a little guitar alongside the legendary Jack Bruce at the Festival of Steve! 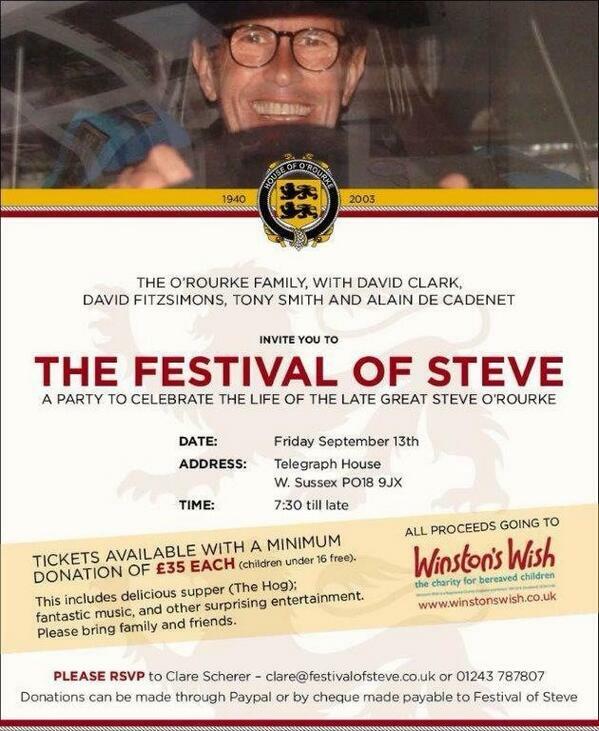 The Festival of Steve is being organised by family and friends in memory of Steve O’Rourke who died 10 years ago leaving two daughters and three sons. His children and family want to hold this event in memory of him to raise money for Winston’s Wish. Steve was a larger than life character who was, for many years, the manager of the influential British rock band Pink Floyd and in later years was an enthusiastic gentleman racing driver achieving fourth position at Le Mans with his private team in 1998. He also enjoyed Historic racing with cars of the 1950s, 1960s and 1970s. The Festival of Steve, being held over the Goodwood Revival weekend is therefore a fitting tribute to both the great man’s passions – he drove many times around the Historic Goodwood Motor Circuit at Revival meetings. Equally regarded in both the music and motor racing worlds Steve was also an active supporter of charities and would be delighted that this event will raise money for Winston’s Wish and their work with bereaved children. Please come and bring friends and family to enjoy the brilliant music and party!